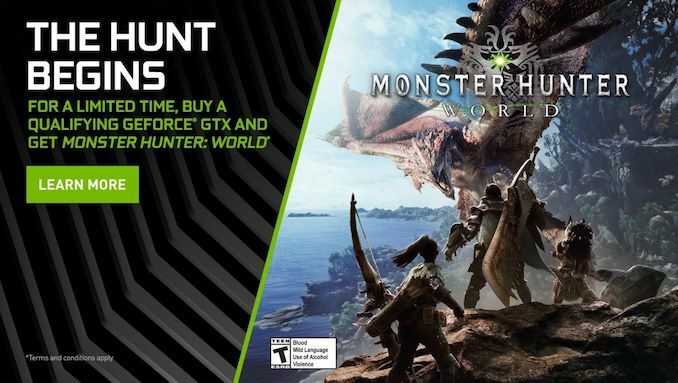 This week, NVIDIA launched their new "The Hunt Begins" game bundle, adding on Monster Hunter: World with qualifying purchases of the GeForce GTX 1070 Ti, GTX 1070, and GTX 1060 6GB (1280 core). The promotion is effective now and runs until November 29th. It appears to cover the usual AIB graphics cards, details are rather sparse from the terms and conditions so any prospective buyers should be sure to double-check the seller/retailer. 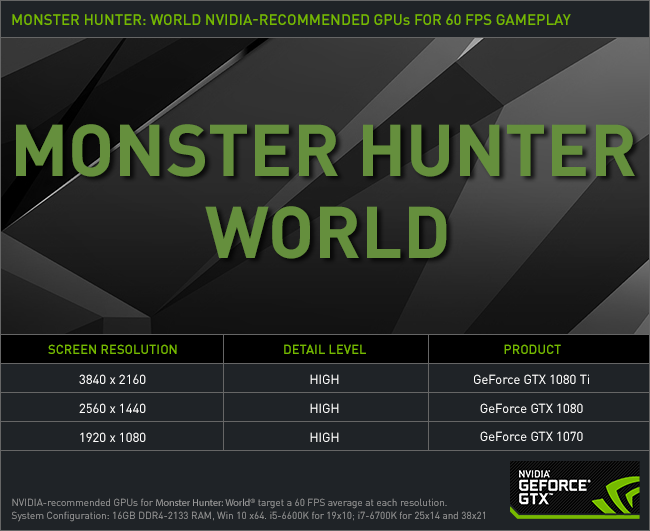 For Monster Hunter: World, NVIDIA recommends the GTX 1070 for 1080p 60fps at High Quality, so the bundle is firmly targeted at mainstream type resolutions and gaming scenarios. No other NVIDIA bundles are running at this time, which is unsurprising given the recent launch of the RTX 20 series. While the promotion clearly covers the upper mid-range of Pascal GeForce, the GeForce RTX 2070, 2080, and 2080 Ti are the intended successor for the enthusiast range. Especially with the RTX 2070 in the GTX 1080 performance bracket, NVIDIA won't be looking to encourage cannibalization via GTX 1080 (Ti) sales over RTX cards. Either way for Pascal, NVIDIA will be looking to clear out their channel of last-gen inventory. It remains to be seen how NVIDIA will pursue the mainstream and entry-level tiers, whether it is with Turing as we currently know it or some other approach. Another note is the revision of GTX 1060 6GB models to include GDDR5X memory, though clocked the same as the original GDDR5. Providing the same amount of memory bandwidth, the logic points to a supply/inventory reason rather than a performance refresh. Codes must be redeemed via NVIDIA Redemption portal on a desktop with qualifying graphics card installed. More information and details can be found in the terms and conditions. Be sure to verify the participation of any vendors purchased from as NVIDIA will not give codes for purchases made from non-participating sellers. "Another note is the revision of GTX 1060 6GB models to include GDDR5X memory, though clocked the same as the original GDDR5. Providing the same amount of memory bandwidth, the logic points to a supply/inventory reason rather than a performance refresh." They probably are excellent by now, but that doesn't mean Nvidia hasn't spent the past three years stockpiling "broken" GP104s. Two and a half years later, STILL pushing pascal. True, but even then going from the 680 to the 780, then the 780ti and then the 980ti, over the course of three years, offered great performance improvements with just tweaking. You didn't understand a thing from what the guy said. GTX680 GPU was a pretty small GPU for being the high end model - it was only ~300mm2. This was because AMD highend part was pretty poor, so nvidia just sold something small and cheap for big money. GTX780TI is much bigger because it had where to grow. Starting from a 300mm2 GPU, you can work your way up until ~600mm2 on the same node. So this GPU was 550mm2, basically the highend GPU that nvidia was planning for the 600 series that never happened. Now, maxwell's 980TI was over 600mm2 in size and it got faster just because they improved by a big margin the memory compression algorithms and stripped the GPU of the FP units. They used that new space for more graphics resources. From Pascal onwards, things have changed. 1080TI is on 16nm, but it is still pretty big at 470mm2. GP100, which is the full fat GPU is very big in size (610mm2) so as big as the 980Ti which was the last increase in size for 28nm. It had HBM2, which was very expensive at the time, so they only sold it in Quadro line-up. Volta is another beast, over 800mm2. That is a HUGE chip and they could launch it on the market but it would cost over 2k. Now, with the RTX line-up, the process is again pushed to the limits. The 2080ti is a huge chip at 750mm2 and considering the price, I think it is quite cheap for the amount of silicon it has.